Ever experienced the frustration when you credit card being stole? Well, Japanese reputable electronic maker, Hitachi Ltd, has come out a new idea to let customers to make payment simply by scanning their finger instead of using credit card. 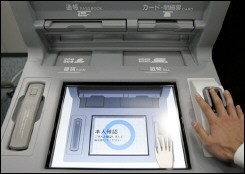 Hitachi has developed a new technology with credit card maker JCB Co. Ltd to come out a new system using biometric technology to identify the veins on a person’s finger, which can serve as a credit card or automated teller machine (ATM) card. A customer who is using this system could just hold his or her finger in front of machine. Without making any contact, the machine would scan the finger and search for the customer’s database in order to match up the customers’ data in the system. Hitachi is of the opinion that the new system based on biometrics is more reliable in term of security and able to prevent fraud. Hitachi said it would launch an experiment in September involving 200 of its employees to see if it is commercially viable to introduce the system in shops, banks and other businesses.